to make ends meet. Eventually she migrated to the capital city, Managua, with her three children, and rooted herself in a church. As a single mom, she envisioned, with creative and innovative imagination, a ministry that was birthed with one single sewing machine. She taught sewing skills to other women so that they could sustain their families by crafting clothes for home use or for sale. I sat in that church classroom and listened to the laughter, the battle stories, and the dignity found in learning how to take broken pieces of fabric and stitch them into something beautiful. My grandmother made sure that prayers empowered and that work liberated them in more ways than one. Doña Sarita was a pillar of prayer and a well of wisdom well-respected in the leadership of our faith community. they arrive at Philippi and find no such man. It is Paul’s custom to first enter the local synagogue to bring the good news of the gospel. In the apparent absence of such a place of worship, on the Sabbath day, he and Silas instead make their way outside the gate of the metropolitan city in this Roman colony. By the river, supposing there might be a place of prayer, they find Lydia, a businesswoman and dealer in purple cloth, who is also a God-worshiper (Acts 16:13). She seems not the least bothered by the fact that there is no synagogue. Instead, a river visited by dedicated women becomes the center for the flow of prayer and the power of God. She listens to what Paul says, and the Lord leads her to open her heart to the message of good news. She and her whole household become baptized. She prevails upon the missionaries and urges them, “If you have judged me to be faithful to the Lord, come and stay at my home.” (Acts 16:15). I sat in that church classroom and listened to the laughter, the battle stories, and the dignity found in learning how to take broken pieces of fabric and stitch them into something beautiful. the Kingdom into Philippi. God had gone ahead and was already working in Lydia and the group of women by the river where they gathered to worship and pray. Paul’s original vision may have been unclear, but it was never uncertain as the Spirit led the way. Lydia throws open the doors of her home with radical hospitality, and she creates a center of operations for this missionary enterprise. In her determination, she invites herself into the mission without asking for permission. She partners with Paul and Silas and, no doubt, these weary travelers enjoy the faithfulness of this new believer who repurposes her possessions to serve the purposes of God. She stands in the company of many women throughout the Bible who lead inside and outside of their home and in the marketplace—much like the female disciples of Jesus who funded and bankrolled his movement (Luke 8:3). Later, after being released from the Philippian prison, Paul and Silas return to Lydia’s home to see and encourage the sisters and brothers, before departing and going on their way (Acts 16:40). work and worship, between spaces of economic and spiritual power. Like the Nicaraguan women washing by the river or my grandmother with one single sewing machine, these small economies don’t seem to stand a chance against bigger corporate enterprises. Nevertheless, all these women are not the least lacking in economic agency and innovation that eventually fund the Kingdom mission. In the ways of the Kingdom, work and worship are creatively interconnected, and power is reorganized from the least expected. The Philippian church partners with Paul’s gospel mission throughout the years. Eventually, Paul would pen a thank- you letter to thank them for the financial gifts of what became one of his most supportive churches. The Philippian church was birthed with the work of prayer by the river. Women worked as they prayed and prayed as they worked. The Philippian church was birthed with the work of prayer by the river. Women worked as they prayed and prayed as they worked. Lydia’s marketplace leadership, partnership in the gospel, and faith were intricately connected to the liberating mission being carried out by Paul. No doubt her innovation and determination were an anchor for Paul’s beloved Philippian church. She always was the woman in God’s dream and vision to build up God’s church. Smith, Hoke. 1971. Filipenses : El Gozo De La Vida En Cristo. Primera ed. Buenos Aires: Casa Bautista de Publicaciones. 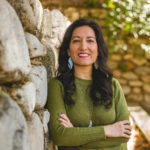 Inés Velásquez-McBryde is an ordained pastor and MDiv student in the School of Theology at Fuller Seminary. She is originally from Nicaragua, but had called Arkansas home since 2001 where she served on staff at two separate multi-ethnic churches. A couple of years ago, her husband, Rob, and son, Nash, drove cross-country in order for her to pursue the dream to attend seminary in Pasadena. She has a passion for the full inclusion of women and racial reconciliation in and through the local church. She also loves the telling of stories over a good café con leche and jamming to salsa music during sermon prep.